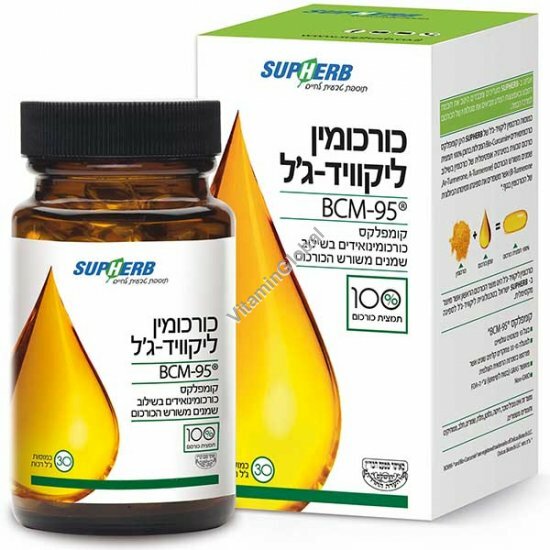 Curcuminoid complex with the revolutionary curcumin patent BCM-95® to ensure maximum efficacy and encourage comprehensive anti-inflammatory action. Powerful combination of 100% quality turmeric concentrate in softgel capsules combined with vital turmeric oils found naturally in the root – just like nature intended! Curcumin liquid gel contains the revolutionary BCM-95® patent. This is a patented compound that provides a complete solution for the problem of bioavailability of curcumin and the other curcuminoid derivatives, through a unique composition including the addition of turmeric oils (turmerones). Tumerones help increase the bioavailability and activity of curcumin in the cells and improves its metabolism in the body (increasing the time it remains in the blood), while containing beneficial and powerful properties. A study published in the scientific journal IJPS proves that the bioavailability of BCM-95® is 1,000% better compared with the standard curcumin concentrate which contains 95% curcumin. Promotes metabolic health and constitutes a support treatment to improve metabolic syndromes (high cholesterol, diabetes, blood pressure). Provides 1000% more bioavailability compared with standard turmeric concentrate. Available in packages of 30 softgel capsules. This information does not constitute medical advice and is not indicatory. In case of a medical problem, contact your physician. This product is not a medicine and is not intended to replace medical treatment.